Background: Current millennial-generation dental students have learning preferences which differ from students of the past. Today's dental students strongly embrace cutting edge technologies, and respond well to a pre-clinical educational curriculum which embraces Evidence-Based Dentistry. Aim: Using the elements of Chickering and Gamson's Seven Principles of Good Practice in Higher Education, this study examined the effectiveness of a contemporary teaching model which differs from the traditional passive “teaching and instruction” approach. Materials and Methods: The Institutional Review Board approved this study. Students from the combined classes of 2012 and 2013 (180 of 191) completed a 25 question survey to evaluate the effectiveness of a teaching model in Pre-clinical Endodontics. Survey questions assessed relevance of class materials, professionalism, and motivation, as well as all facets of the Teaching Model. Scoring employed a three point Likert scale: Excellent (3); Good (2); and, Poor (1). Descriptive statistics were used to determine students' perceived understanding of the course. The comparison between students' mean responses in the sophomore class of spring 2012 and the class of spring 2013 was conducted using a two sample independent t-test to test for differences in mean scores among the two groups. The survey instrument used in this class assessed encouragement of contact between students and faculty (Principle 1); development of reciprocity and cooperation among students (Principle 2); encouragement of active learning (Principle 3); prompt feedback (Principle 4); emphasis of time on task (Principle 5); communicating high expectations (Principle 6); and respecting diverse talents and ways of learning (Principle 7). Results: This paper highlights a newly designed Teaching Effectiveness Model to teach pre-clinical Endodontics to sophomore dental students. Statistical analysis of Likert scale data demonstrated a relationship between the Seven Principles and the Teaching Effectiveness Model. Conclusion: The effectiveness of this teaching model was confirmed by the high pass rate scores (98, 100%) in 2012 AND 2013 classes on the endodontic section of both the written National Board of Dental Examiners and the endodontic section of the clinical state and regional board licensing exams. Current Millennial-generation dental students have learning preferences which differ from students of the past. Today's dental students strongly embrace cutting-edge technologies and respond well to a preclinical educational curriculum which embraces evidence-based dentistry. Learning theories, instructional design, assessment protocols, as well as curriculum changes were examined to develop a preclinical Endodontic Teaching Effectiveness Model [Figure 1]. Four semesters of student course evaluations were used to analyze the didactic success and effectiveness of the model at a historically black College in the United States of America. Using the elements of Chickering and Gamson's Seven Principles of Good Practice in Higher Education, this study examined the effectiveness of a contemporary teaching model which differs from the traditional passive “teaching and instruction” approach. This study hypothesizes that there is a strong relationship between the Seven Principles and the Teaching Effectiveness Model. This participatory “learning practices” model incorporates “learning facilitation” whereby the professor facilitates the instruction, and the student becomes a more active participant in the learning process. This approach is emphasized in the Commission on Dental Accreditation (CODA) and American Dental Education Association (ADEA) curriculum standards. Dental School curricula in the US and Puerto Rico are designed to comply with standards developed by the CODA. Likewise, the ADEA  approved competencies in 2008 that provide additional curriculum guidelines for the newly trained dentist. Utilizing the concepts of evidence-based initiatives outlined in CODAs standard no. 2, Section 2.5, a teaching model built upon a learning-centered approach  encourages students to become self-directed learners in preclinical endodontics. The 2008 ADEA competencies  position paper shares similar goals with, and is based on, an earlier 2002 list of core competencies for patient care developed by the National Academy of Sciences Institute of Medicine. ADEAs competencies specify six fundamental elements termed “domains” and include (1) critical thinking, (2) professionalism, (3) communication and interpersonal skills, (4) health promotion, (5) practice management and informatics, (6) and patient care. Positive student evaluations of this Teaching Effectiveness Model will confirm its adaptability as a helpful template for any preclinical curriculum. This article highlights a newly designed Teaching Effectiveness Model [Figure 1] to teach preclinical endodontics to sophomore dental students. Study participants were students from the classes of 2012 and 2013 who transitioned from sophomore to junior level during their respective years. The class design for this course is composed of didactic and technique laboratory components. 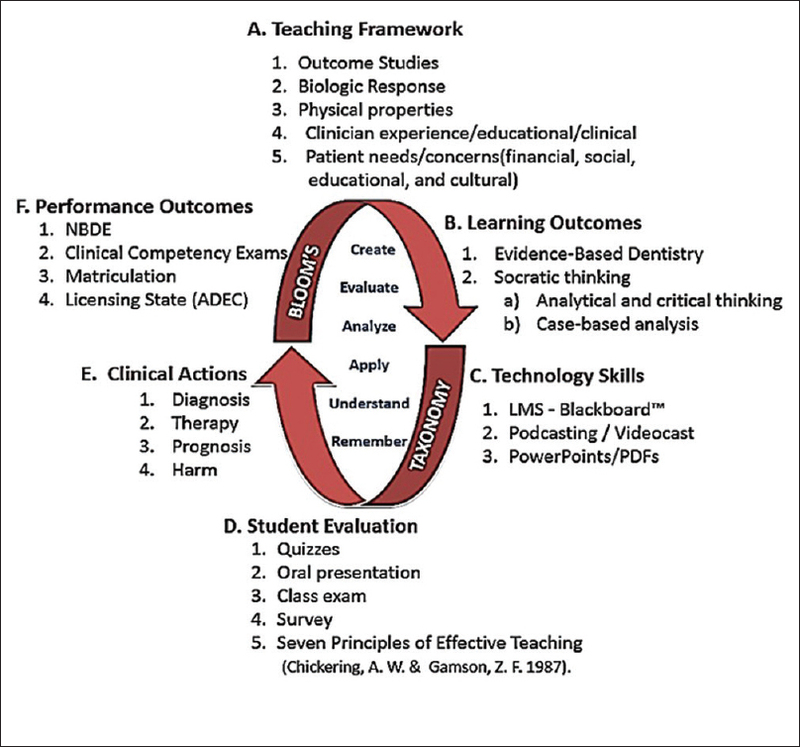 As illustrated on the teaching effectiveness model, the teaching framework uses five teaching concepts emphasizing learning outcomes to provide a roadmap to help students become competent in clinical endodontics. The Blooms' Taxonomy framework  is integrated throughout the model. Utilization of technology addressed different learning styles. Student evaluations are based on the Seven Principles of Good Practice, which have been validated as a framework for assessing undergraduate education. The course provides the basis for understanding the four components of clinical actions before proceeding with patient treatment. In addition, the preclinical endodontics curriculum provides the didactic and clinical preparation for students to succeed in National Board and Licensing Examinations. Past studies have mostly offered a general overview of the learning of actual clinical endodontic procedures. Relatively few have been didactically focused or been evaluated for teaching effectiveness, especially in the realm of preclinical endodontics. 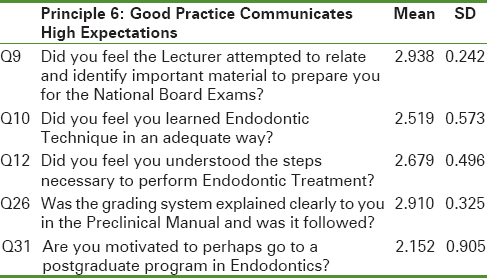 In one study, Brazilian dental students were surveyed for their opinion regarding their endodontic learning experience while treating patients. 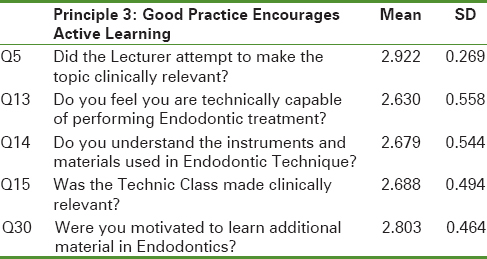 This cross-sectional study, conducted in 2010, examined the time resources required to learn clinical skills, difficulties encountered, techniques employed, quality assessments of the learning process, and suggestions to improve endodontic teaching. The authors focused on the techniques employed and not so much on teaching methodologies. They found that students' perceptions were crucial in the learning process and should be given priority in designing a preclinical curriculum and enhancing the faculty-students' relationships. The preclinical sophomore endodontic training at this college is a one semester, six credit hour class. A 2 hour classroom teaching component in the morning is followed by a 4 hour afternoon preclinical technique laboratory. The didactic component complements the technical aspects of the preclinical laboratory. The didactic portion on a typical day consists of a 1 hour faculty-led lecture, complemented by three separate 20 min long student-led oral presentations. Throughout the semester, students are assigned two to a “team”, and each “team” presents a 20 minutes lecture. The class syllabus highlighting the objectives, guidelines, course expectations, and grading protocol employs the Blackboard ™ course management system. Each student team's oral presentation includes PowerPoint Presentations, videos, and the presentation of actual clinical cases including radiographs. Each teams' presentation is required to highlight evidence-based dentistry materials. Emphasis is placed on the interdisciplinary working relationships between endodontics and the other clinical disciplines. At the end of each team's presentation, the presenting team quizzes fellow classmates on the presented material. Senior endodontic department faculty is present to help guide discussions and provide constructive criticism of the presentations. A hands-on experience using manikins as well as bench mounted dentoform teeth help students develop the necessary psychomotor skills and manual dexterity needed for successful endodontic techniques. The 4 hour semester long afternoon preclinical technique laboratory closely integrates the evidence-based material presented in the morning didactic component. The “best clinical outcome” concept guides the Socratic questioning method used during both morning and afternoon sessions. Questioning by faculty and fellow student team members enhance student thinking, comprehension, and analytical skills. To integrate CODAs  and ADEAs  competencies and standards into the curriculum, five basic concepts within the teaching framework [Figure 1] are applied. These could be easily adapted into any didactic or pre-clinical learning module. Contemporary diagnostic workups and treatment planning should be based on the most current evidence-based outcome studies. In the School of Dentistry Undergraduate Endodontic curriculum, the current evidence-based information is presented using evidence-based journal articles, PowerPoint presentations, videos, podcasts, and student-led oral presentations. Learning outcomes and technology skills are listed in [Figure 1]B and [Figure 1]C.
Understanding the biological response of dental materials and techniques means that students need to skillfully search, analyze, synthesize, and evaluate, scientific literature. Optimal patient care requires familiarity with the latest information on pulp biology. Rapid advances continue to occur in the areas of dental materials, pulp and root instrumentation, and techniques for delivering and placing endodontic compounds. Students are required to be familiar with the physical properties of current materials and new instrumentation techniques. Each student completes a self-evaluation of their clinical skills, clinical knowledge, and ability to properly manage an endodontic patient. These self-assessments help to identify any critical student limitations during the preclinical phase. Students are sensitized to understand patient's needs and concerns. These may be of a cultural, social, religious, financial, and/or psychological nature. Cultural and clinical competencies complement one another to help ensure a successful student doctor–patient relationship. Student requirements and expectations are outlined in the syllabus and throughout each assignment. These exercises enhance students' knowledge and skills required in the preclinical endodontic experience. Assessment of students' performance provides insights into what they know and can do and drives them toward desired outcomes. Lecture presentations for the entire course are posted at the beginning of the semester on Blackboard Inc., learning management system. This gives students the opportunity to read ahead and to be better prepared for Socratic questioning during class. While presenting important concepts, the instructor invokes rhetorical questions for clarification and probes assumptions to identify reasons and evidence. Viewpoints and perspectives are solicited, and implications and consequences are questioned. This challenges students to think and encourages them to read and prepare for classes beforehand. The class objectives and learning outcomes are clarified. Frequent oral presentations ensure that students can define, compare, and contrast the relevant didactic and clinical information necessary to prepare for regional and national licensing examinations. The Millennial generation was born between 1977 and 1995 and entered into the new era of technology. Recently, the Pew Research Center noted that young adults considered their use of technology to be the distinguishing feature of their generation. Engaging this generation with multimedia projects is second nature to them. Students have the option to use various multimedia tools to enhance the quality and effectiveness of their class presentations. While accommodating different learning styles, comprehension of concepts is reinforced by relevant YouTube and Vimeo videos (video sharing sites) and engaging class presentations. Student-to-student quizzes are conducted after each presentation through Crossword Puzzles, Bingo, and Word Scrambles. In a learning-centered classroom, students become learning partners. Having students evaluate the effectiveness of this teaching effectiveness model enhances the ability of an instructor to improve their teaching based on students' feedback. Quizzes and class examinations were randomized and offered on Blackboard Inc. As soon as students have submitted the quiz or examination, they receive prompt feedback on their performance and are invited to further discuss any concerns or questions in subsequent classes. Student evaluations of the teaching model are incorporated in the method section of the paper. The Seven Principles of Good Practice in Higher Education , survey instrument strongly emphasizes the teaching effectiveness model. The preclinical endodontic experience allows students to build sound clinical foundations before treating actual patients. The teaching effectiveness model allows students to develop decision-making skills for clinical action. Through didactic presentations and clinical case-based analysis (learning outcomes, [Figure 1]B), students become proficient in four clinical action areas: (1) diagnosis, (2) therapy, (3) prognosis, and (4) harm or consequences of treatment. The student performance outcomes are evaluated by overall pass rate and score in the clinical endodontic written section of the National Boards. This examination is taken at the end of the sophomore year. Furthermore, starting in the sophomore year, students complete multiple yearly endodontic clinical competency examinations. The successful passing of a final clinical endodontic competency examination, during the senior year, is required for graduation. For the current study, the authors assessed the “student” clinical performance by analyzing the success rate of the College's School of Dentistry's recent “newly graduated doctors” in passing the endodontic section of the regional and state dental licensing examinations. The Institutional Review Board for this study was approved. One hundred and eighty of 191 students from the combined classes of 2012 and 2013 completed a 25-question survey to evaluate the effectiveness of a teaching model in preclinical endodontics. Survey questions assessed the relevance of class materials, professionalism, and motivation, as well as all facets of the teaching effectiveness model [Figure 1]. The model itemized with symbols from A–F includes (A) teaching framework, (B) learning outcomes, (C) technology skills, (D) student evaluations, (E) clinical actions, and (F) performance outcomes. Scoring employed a three-point Likert scale: excellent (3), good (2), and poor (1). Descriptive statistics were used to determine students' perceived understanding of the course. The comparison between students' mean responses in the sophomore class of spring 2012 and the class of spring 2013 was conducted using a two-sample independent t-test to test for differences in mean scores among the two groups. Statistical testing used a 95% confidence interval with rejection of the H0 at P < 0.05. The teaching effectiveness of this model was tested using the elements of Chickering and Gamson's Seven Principles of Good Practice in Higher Education. These principles have been tested extensively as a proven didactic analytical framework. The survey instrument used in this class assessed encouragement of contact between students and faculty (Principle 1); development of reciprocity and cooperation among students (Principle 2); encouragement of active learning (Principle 3); prompt feedback (Principle 4); emphasis of time on task (Principle 5); communicating high expectations (Principle 6); and respecting diverse talents and ways of learning (Principle 7). This paper highlights a newly designed Teaching Effectiveness Model [Figure 1] to teach preclinical endodontics to sophomore dental students. Statistical analysis of Likert scale data demonstrated a relationship between the Seven Principles and the Teaching Effectiveness Model. Overall, the results of testing the Effective Teaching Model were favorable within all principles and facets of the model [Figure 1]A,[Figure 1]B,[Figure 1]C,[Figure 1]D,[Figure 1]E,[Figure 1]F. Likert scale elements were defined as excellent (3), good (2), and poor (1), with a 3 being a perfect score reflecting a high level of agreement by the student. Providing clear guidelines and defining specific standards for timely instructor responses to student inquiries both help to encourage student–faculty interaction. Principle 1 in [Table 1] shows the means of student–faculty contact between 2.7 and 2.9 and the standard deviation ranging from 0.31 to 0.575. In all the tables [Table 1], [Table 2], [Table 3], [Table 4], [Table 5], [Table 6], [Table 7], larger values of the standard deviations for each question indicate a wider variability around the mean. Lower values suggest that the scores are closer to the mean. The means of Principles 1, 2, and 3 are displayed in [Table 1]. Well-designed students' presentations, discussions, and peer testing facilitate meaning interaction and cooperative learning among students [Figure 1]B and [Figure 1]C, learning outcomes and student evaluation]. As illustrated in [Table 1], the mean score of Principle 2 ranged between 2.6 and 2.7. Researchers found that learning occurs within six levels of cognitive awareness including knowledge, comprehension, application, analysis, synthesis, and evaluation [Bloom's Taxonomy - wheel of Model, [Figure 1]. Oral presentations provide students the opportunity to use cognitive and psychomotor skills to create projects in teams which encourage active learning [Figure 1]D, student evaluation]. The mean scores of Principle 3 ranged from 2.6 to 2.9. While presenting important concepts, it is important for the instructor to invoke rhetorical questions for clarification, probing assumptions to identify reasoning and evidence through Socratic questioning [Figure 1]B, learning outcomes]. This allows for providing prompt feedback in both didactic and clinical technique procedures. In Principle 4 on [Table 5], the mean score for providing information and acknowledgment feedback was 2.9 [Table 1]. The means of Principles 4 and 5 are displayed in [Table 2]. Deadlines for assignments, oral presentations, quizzes, and examinations were provided and clarified on the syllabus at the beginning of the semester and posted on Blackboard Inc. [Figure 1]C and [Figure 1]D, technology skills and student evaluation]. Being reminded of all deadlines emphasized time on task. The mean scores of Principle 5 ranged from 2.7 to 3.0 [Table 2]. Setting high expectations of students' performance challenges them to develop critical thinking skills and encourages them to read and prepare for classes beforehand. This increases the understanding of class objectives and knowledge of evidence-based treatment procedures [Figure 1]B and [Figure 1]E, learning outcomes and clinical actions]. This prepares them for successful accomplishment on the written National Board and Clinical Licensing Examinations [Figure 1]F, performance outcomes]. The mean scores of Principle 6 ranged from 2.5 to 2.9 [Table 3]. By addressing different learning styles, students were able to appraise and understand materials covered in the preclinical course. Students select topics of evidence-based material for oral presentations in teams that supplement lecture material. In addition, the teams are encouraged to apply search skills, find, and evaluate clinical cases relevant to patient care. Analyzing the individual topics allowed students to apply their ingenuity to create videos, podcasts, and engaging PowerPoint presentations [Figure 1]A,[Figure 1]B,[Figure 1]C,[Figure 1]D,[Figure 1]E. As shown in [Table 4], the mean scores of Principle 7 varied from 2.5 to 2.9. For the sophomore classes of spring 2012 and spring 2013, a comparison between the mean values of the students' Likert scale responses was completed. A two-sample independent t-test was used to assess the difference in mean scores. The test was conducted at a 5% significance level which indicates that the H0 will be rejected at P < 0.05. Sixteen questions listed on Appendix 1 were highly rated between 2.7 and 3.0 except for Principle 2. The mean scores of emphasizing cooperation among students (Principle 2) ranged between 2.6 and 2.7. Another observation was that the scores for the spring terms 2012 were slightly higher than the scores for the spring term 2013. The difference could be due to the modification of the curriculum to include new advances in technical and clinical practice. All of the survey responses illustrate the effectiveness of this contemporary teaching model when evaluated using Chickering and Gamson's Seven Principles of Good Practice in Higher Education. A learning-centered classroom was created allowing students to become self-directed learners. Instructors were available to respond to questions through office hours, email, or cell phone. The teaching effectiveness model [[Figure 1], Area A] provided students with theoretical guidelines, and an emphasis on outcome studies. Basing the course curriculum on evidence-based material, librarians partnered with students to teach skills for searching and evaluating reliable information from authoritative sources. Case-based analyses provided further development in meeting the learning goals. Positive scoring of questions relating to the Seven Principles included student–faculty interaction (Principle 1), meaningful cooperation among students (Principle 2), active learning (Principle 3), prompt feedback (Principle 4), and emphasis on time and task (Principle 5). In addition, 96% of students concurred that they were tested on the actual presented material, and that the information was relevant in preparation for the National Board Dental Examination. Two categories, namely, Principle 6 relating to challenging tasks and Principle 7 regarding student use of evidence-based topics for oral presentations were each rated below 90%. Students suggested incorporating more clinical materials into the oral and lecture presentations. This Teaching Effectiveness Model proved to be highly effective when applied in preclinical Endodontics. The Blooms' Taxonomy framework  [Figure 1], center wheel] was integrated throughout the model. Utilization of technology addressed different learning styles. Students were able to appraise and understand materials covered in the preclinical course. Analyzing the individual topics allowed students to apply their ingenuity to create videos, podcasts, and engaging PowerPoint presentations. Comprehension of material was evaluated by student-designed Crossword Puzzles, Bingo, and Word Scrambles. Participants of this study were limited to only two classes at one institution. Greater than 95% minority class profile may limit direct institutional comparisons. Students were polled only twice as sophomores and juniors. No Kappa or Kendall statistical tests for intercorrelation validity were performed. Integrating the CODA standards as outlined in the Undergraduate Dental Education Curriculum was determined to have a significant practical impact on didactic effectiveness. Developing a teaching effectiveness model for this class helped to streamline a measurable process. The importance of institutional and administrative support in helping to ensure the success of undergraduate professional students was demonstrated. The School of Dentistry classes of 2012 and 2013 had a 98%–100% pass rate on the endodontic section of the National Board Examinations. Similarly, the endodontic section clinical pass rate for the Class of 2012 and 2013 on Regional Board Licensure Examinations exceeded 97%. Recommendations for future studies should exceed at least 5 years of measuring the effectiveness and consistency of this model. Chickering A, Gamson Z. Seven principles of good practice in undergraduate education. AAHE Bull 1987;39:3-7. Commission on Dental Accreditation (CODA). Available from: http://www.ada.org/en/coda. [Last accessed on 2013 Jan 20]. American Dental Education Association (ADEA). Available from: http://www.adea.org/about_adea/governance/Pages/Competencies-for-the-New-General-Dentist.aspx. [Last accessed on 2017 Jan 20]. Weimar, M. Learner-Centered Teaching: Five Key Changes to Practice. 2nd ed. Somerset, NJ: Jossey-Bass;2013; p. 305. ISBN: 9781118119280. National Academy of Sciences Institute of Medicine (IOM). Available from: http://www. Iom.edu. [Last accessed on 2014 Jan 10]. Anderson LW, Sosniak LA, editors. Bloom's taxonomy: A forty-year perspective. Ninety-third Yearbook of the National Society for the Study of Education. Chicago: University of Chicago Press; 1994. Seijo MO, Ferreira EF, Ribeiro Sobrinho AP, Paiva SM, Martins RC. Learning experience in endodontics: Brazilian students' perceptions. J Dent Educ 2013;77:648-55. Friedlander L, Anderson V. A new predoctoral endodontic module: Evaluating learning and effectiveness. J Dent Educ 2011;75:351-9. Pew Research, 2010 – Millennial and Technology. Available from: http://www.pewresearch.org/millennials/teen-internet-use-graphic/. [Last accessed on 2013 Apr 12]. Wyer PC, Silva SA. The Roadmap: A blueprint for evidence literacy within a scientifically informed medical practice and learning model. Eur J Person Cent Healthc 2012;1:53-68. American Association of Endodontists. Case Difficulty Assessment Form. Available from: http://www.aae.org/education/educator-center/teaching-resources/teaching-materials.aspx. [Last accessed on 2017 Aug 12].